A student PC for just $35? Apparently so. We first heard about the ultra-low-cost laptop a year ago, when India's Ministry of Human Resource Development unveiled the device as an educational tool for students. Critics scoffed at the bargain computer, questioning whether a usable device could be manufactured at such a low cost. Plus, photos of the prototype revealed a homely tablet PC with seemingly limited capabilities. Could students put such a device to good use? Fast-forward a year and the $35 computer project is still on. In fact, Kapil Sibal, India's minister for human resource development, tells The New York Times that the bargain device will arrive within a few weeks. 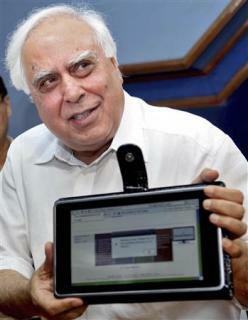 "All the naysayers will be unpleasantly surprised," Sibal told The Times. Indian officials have yet to announce the names of the laptop's manufacturer(s), or say when production will begin. Basic features should include a touchscreen, Wi-Fi, a keyboard, 2GB of RAM, a USB port, and a 2-watt power system for regions with shaky electrical grids, according to a July 2010 report in The Economic Times. More than one million of the devices will be produced and sold to colleges and universities in India, which faces a shortage of teachers. Indian officials see the laptop as an even more affordable alternative to a $75 low-cost computer planned by nonprofit organization One Laptop Per Child (OLPC). OLPC is designing a sub-$100, solar-powered tablet for emerging markets. It hopes to ship the device next year or sooner.